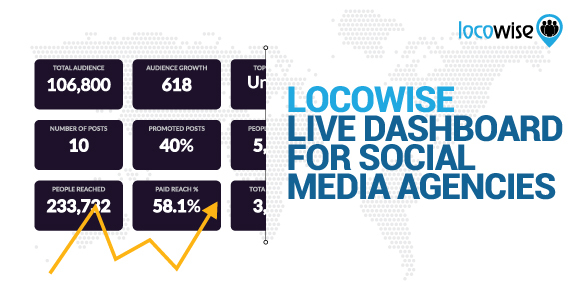 In Locowise, the live dashboard is a useful tool that allows digital marketing agencies to track the performance of multiple social media accounts with near-instant updates. It keeps an eye on the movement of different analytics and shows it in a highly visual manner. Easily customizable, it is one of the features of our social performance measurement tool that all of our clients love and enjoy in multiple ways. Easy to implement within a streamlined brand management process for multiple profiles, such a tool is considered to be perfect for goal-tracking within both smaller and bigger teams. In fact, in theory, a live dashboard for social media tracking can encourage teams to perform better. Yet, does that actually happen? From the beauty of gamification through the purposefulness of goal-oriented management, we decided to once again look at the big picture and discuss whether or not putting a huge display with a live dashboard in the center of your office for everyone to see is a good idea. Gamification is one of those terms that marketers either love or completely despise. For work-related endeavors it is used to describe the optimization of the work space and a work process with an achievement-based orientation. As the term itself suggests, the psychological idea is to tap into our motivation for better performance via game-like challenges and goals. During the past five to ten years, gamification has been in the center of work process conversations due to the high impact it might have on a team’s overall motivation. If implemented correctly, it can increase the engagement of employees leading to better workplace environment and results. In fact, we’ve previously covered how you can turn your work process around with a nice attitude shift and a bit of organization. However, gamification goes a step further. If you’ve ever played a mobile or PC/Console game, you’d know that achievements and levels are often used as motivation for the player to process further. The idea behind gamifying a work process is a bit similar. Helping people be more engaged via tangible goals can increase their productivity. But for people to be heavily involved you often need a tracker to remind them of their current progress. That’s where a live dashboard for social media performance tracking can go into play. A digital marketing process can use multiple measurements to define its success or failure. In fact, different campaigns can target improvement in a highly specific metric, such as audience growth, total engagement and engagement rate. The decision of which metric is most important at a given time is usually determined by the size of a client. 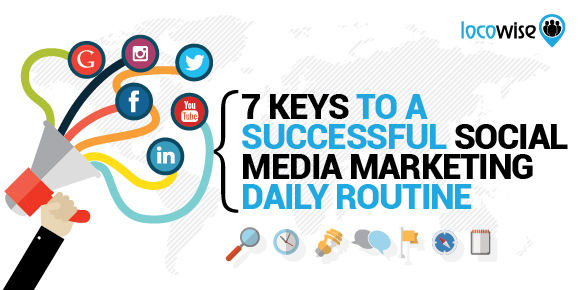 Nevertheless, nine times out of ten, a social media marketing strategy is goal-oriented. This goal also often boils down to a single number. (Think achieving a “100K followers” milestone on a Twitter account.) And depending on the size of your team, campaign and the milestone itself, reaching that goal can be an actual event in the office. Having a live dashboard that keeps track of the metrics your team is most interested in can serve as a gamification filter in the workplace. A conversation starter, a board that helps people respond instantly to changes and a way to track your goals, live dashboards can shape the working environment in a positive manner. And this is especially true in the rather intangible social media management process. Imagine the audience size of a brand account growing after a new post has been uploaded. Even if the growth is a single digit one, it will raise the engagement and the motivation of the team. Having direct visual proof of the effect a single post or an update can make plays around the value factor of the human psyche. What’s more, a live-dashboard can increase the competitiveness of team members. If you keep track of multiple brand accounts, you can set the live dashboard for multiple accounts on social media to track all of them and show the best performing one in each category. This will help people in your team be more engaged with the brand they are representing. Furthermore, tracking a competitor brand can help with the ambition of a digital marketer to overtake an industry on social media and thus help the client they are representing. One of the ways you can think of live dashboards when managing multiple social media teams is the infamous “employee of the month” plank you can see in many workplaces. Having a display at a visible space in your office that tracks multiple social media accounts and brands and shows the best performance measurement analytics and data from all of them is something that is quite similar. Teams and members that have helped a brand skyrocket in performance, for example, would be able to share their achievements with their coworkers straight from the live dashboard display. However, unlike “employee of the month” planks, a live dashboard display doesn’t have any negative side effects. As you are not singling out employees, but rather using specific social media data, such displays are often perceived only in a highly motivational and employee engaging sense. What’s more, you don’t need a specific gamification reward based or goal oriented system in place, to just put up a live dashboard and let your team be able to constantly engage with the performance of the brands they are in charge of on social media. 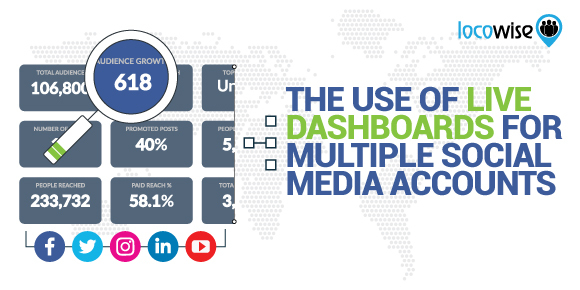 How do you set up a live dashboard display for social media analytics? Setting up the display is a rather simple process. Of course, we are using our own Locowise social media performance tool as an example. With our tool, all you need to do to keep track of multiple social media accounts is to have them in your profiles and select them from your live dashboard screen. There you will also have the option to customize the dashboard to your liking in terms of a color scheme and upload the logo of your business so that it shows on the dashboard. Tip! The live dashboard display is also extremely helpful if you have clients or potential clients visiting often. By having one or multiple screens that keep live track of the social media performance of brands, clients will be aware that you are highly engaged right when they set foot in your offices. Setting up the display itself can be done in a variety of ways. In terms of tech, you can easily connect the display with the office server or an external PC. You can even use an old laptop, if you are searching for a budget option, or another device and use it as the source for the live dashboard screen. In fact, we would advise consulting with your IT or technology advisor for the best option for you. In terms of the placement of the display, it is also up to your particular case. Just make sure that the live dashboard for social media measurement is somewhere that is easily seen throughout the office and that it can be seen from any potential clients that come to visit your offices as well. It’s all about the live social media analytics! A live dashboard that keeps track of your social media performance is not something everyone thinks about. In fact, the benefits of live data tracking in an office environment are often neglected. Nevertheless, being able to be directly engaged with the constantly updated analytics related to the social media profiles you are tracking can certainly have a huge impact on the performance of your team. And the notion is not that hard to imagine. Just think about it! You are trying to come up with the next social media marketing campaign for one of your clients. You roll around in your chair, trying to get your creativity going, but it just doesn’t move. And there you see the live dashboard with the social media performance of your brand right in front of your eyes. The slightly changing numbers engage your attention and your thoughts start spirling, finding the much needed creativity you were craving to find. This story might seem rather obnoxious or too speculative, but it’s true. Live dashboards and the engagement that comes with them have helped multiple members of our team be motivated and creative. In fact, a live dashboard display often serves as a conversation starter and a conversation piece, helping the overall atmosphere in the office. It’s something productive, engaging and it makes you feel like you are a trader at Wall Street. But your particular case is even better. You are a social media marketer, looking at live dashboards for social media performance! 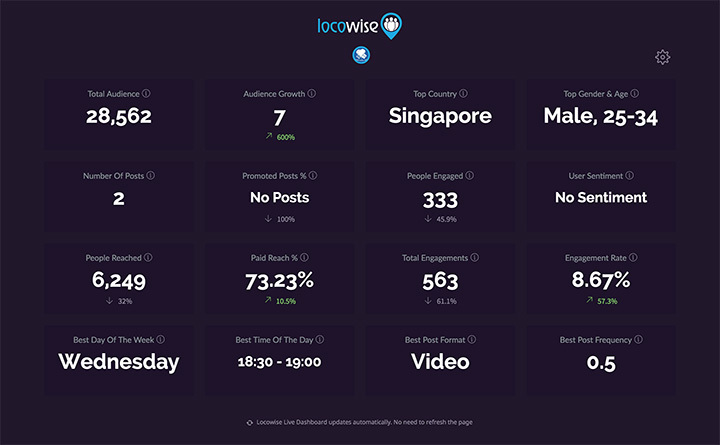 Want to try out the live dashboard for social media performance we have at Locowise? Make sure to sign up for a free 7-day trial and get your fix right now!